GPS Navigation UK & Ireland is a turn by turn navigation app designed for iPhone and iPad. 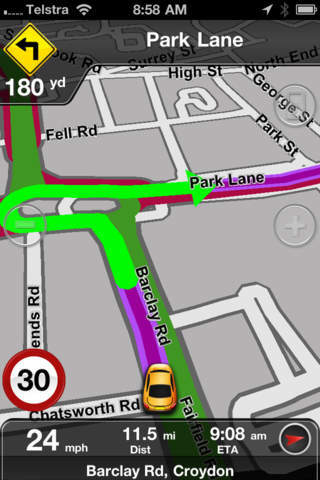 GPS Navigation UK & Ireland is powered by MetroView - the number 1 navigation app in Australia. GPS Navigation UK & Ireland uses the latest premium TomTom Data. Traffic cameras are available via in app purchase. Latest all UK and Ireland Maps stored on the device. Optimised HD support for iPhone 4s and the new iPad in the same application. High quality spoken turn instructions including spoken street names. SpeedAlert - Licence saving national coverage for speed zones. POI search using locally stored data and Google Local Search (requires internet connection). No ongoing subscription costs, FREE to use after initial purchase. 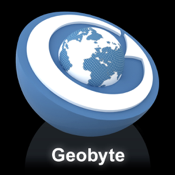 All UK map data stored on phone - no download costs for mapping or navigation. The same application can be used on all iPhone models and iPad. Analogue and digital speedo views. High quality spoken street names including UK accented male and female voice options. Walking mode including compass functionality to point you in a straight line to your destination. A windscreen or dashboard mount is recommended. Geobyte Europe supports the TomTom Car Kit for iPod and iPhone. Some devices require an external GPS receiver. Please confirm your device includes a GPS.